Be still. Breathe. Ask for guidance. Breathe. Be still and listen. Your wise self is like your ship in the ocean: it will help you ride the waves and get you back to safety. Think of it as your personal navigation system that takes you back to your true self. The knowing has been within you all along. This little treat made its debut at a dinner party last year; it was served to us by our friend Nicole and it was a complete and utter show-stopper. Not only did we devour it after our lovely meal, but I proceeded to eat the leftovers we were sent home with for breakfast the next morning! After all, with simple wholesome ingredients, no wheat, refined sugars, or dairy, it’s practically oatmeal! Of course I had to have the recipe and have since made it quite a few times with a similar reception. The original, more cinnamon-y, recipe comes from Baker Bettie and can be found here. My slightly tweaked version is below. Thanks for sharing Nicole! Instructions Preheat oven to 350 degrees and lightly oil an 8×8 brownie pan. Make the caramel sauce first by blending all ingredients together in a powerful blender. Make sure your maple syrup is room temperature or it will make the coconut oil stiffen. Blend until silky smooth and thoroughly combined (Bettie recommends at least two minutes). In a separate bowl, add the brownie ingredients and 1.5 cups of the caramel sauce. Reserve the remaining sauce in a bowl for later. Pour into brownie pan and bake for 12 minutes or so (do not over-bake–fudgey consistency is where it’s at!). 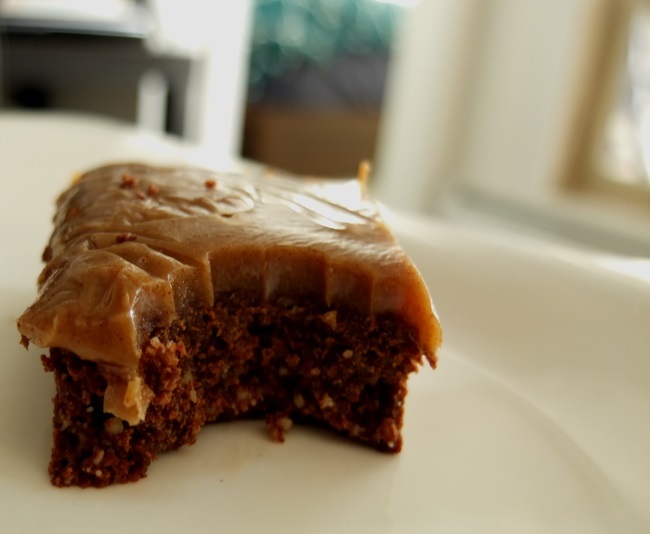 Once cooled, spread the remaining caramel sauce on top with a spatula. Be sure to lick the spatula clean when done! Serve warm with a dollop of coconut vanilla ice cream and let your wise self have the day off. Looks so decadent! I want some now! Oh my, trust me it is! Thanks for reading, Elizabeth!